Phronk.com: The Future of Advertising? Virgin Mobile Canada has recently launched a blog called Screw You Recession. It's a bizarre mish-mash of money-saving tips, celebrity gossip, and random entertaining links. Like everyone else lately, there is also an @virginmobilecan Twitter account with similar content (e.g., they tweeted from the recent Britney Spears show in Toronto). In one way, this is sorta awesome. They're embracing the new reality of the internet and trying to connect with people through content they relate to. People like celebrity blogs and Twittering, so why not create those things then sprinkle in plugs for their product? Well, because, in another way, there's something inherently dishonest about the whole thing. They don't really care about creating a quality finance/celebrity blog. They don't really care about connecting with people through Twitter in the way it was intended. They're only tweeting from Britney concerts because Virgin is the sponsor of the tour. When they tweet "only mins away from britney!! anyone see her??!! ", I really doubt they expect any of the 100 people following Virgin's twitter account to be within eyeshot of Britney. And it spreads. They're reaching out to bloggers, paying them to write about all this marketing gunk. Unless this post doesn't really count, I'll get $30 for those links up there. But see, I don't really care about plugging Virgin Mobile. The only way I can keep from feeling like a dirty sell-out blog whore is to make fun of it all. Wanna know how to play the internet right? The best example I can think of is a local one. London's main newspaper, the Free Press, has all sorts of staff members that blog and are on Twitter. Dan Brown, the senior online editor, has a blog and a Twitter account where he actually writes about stuff he cares about and interacts with the people who read it. Sure it draws attention to the newspaper, but it does so without sacrificing that all-important authenticity. Authenticity can't be faked by jumping on the nearest technological bandwagons. Thirty bucks? 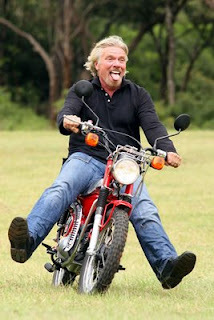 You know how much money Branson has? You could easily have got, like, forty... But if you're talking "authenticity," I'd have held out for forty-five or fifty -- close to the cost of one of Virgin Mobile's vile, corporate, heartless, non-ironic, we-spent-all-our-money-sponsoring-the-Olympics competitors. Nobody uses Twitter properly. If I was to remove all the people that just posted nonsense I'd only be following about six people. You'd be gone - I don't need to know that you went shopping hungry yesterday and bought creme filled pastries, but I do know that cause of Twitter. I have to agree: Make the content king and the ad dollars will come from that. I was giving SYR the benefit of the doubt when I wrote about it, hoping it would lose the feeling of advertorial if it grew and took off. As for using Twitter properly I believe Steven Colbert said it correctly: "I've twatted"
Brian: I know eh? I asked for a million dollars, but $30 is still a few more meals in my belly, so I'll live with it. Rob: But isn't nonsense the original purpose of Twitter? Look at the examples on the main homepage - crap about landing in airports and insomnia. I'm all for using it in whatever way one pleases (there's always the unfollow button), but I think its original use is to keep up with the mundane lives of friends and be an exhibitionist about one's own mundane life. And again - it's fine to use it for marketing, if done authentically rather than as a cheap stunt. DR: Yeah, it's all about content. And often content suffers if its only purpose is to sell unrelated products. But yeah, it is totally possible for something like SYR to take off. More power to it if it does. He has time to edit your paper between penning badly written novels about Jesus having children that I want to put down because, hello, baaaaadly written but I can't because I'm fascinated and can only put it down long enough to go Google the Last Supper painting and....OMG....that guy is totally a chick!!!... ? Hehe I feel exactly the same way about (the other) Dan Brown. OMG Angels and Demons the movie is coming out sometime soon! There are so many bloggers in the blogosphere who create content strictly for the fact that they will get paid to do so. I find posts that do so boring and forced. Who wants to read something that is bland and where little thought has been put included? I just wanted to tell you that I have browsed your blog and I am really enjoying reading it! You have great ideas for your posts and present them in an interesting way! You have inspired me to make my blog better- so thanks!